What is Otomax Suspension used for? 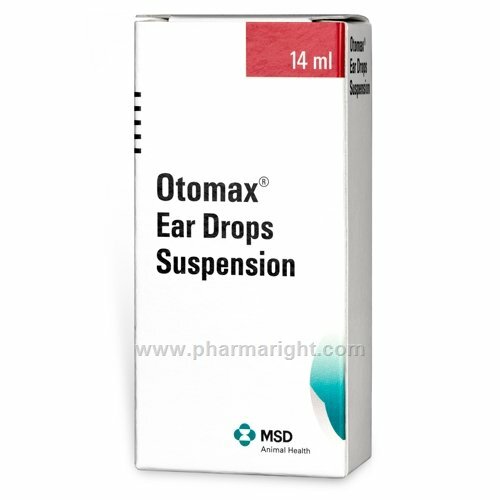 Otomax Suspension is a combination medication used as a topical treatment for chronic and acute otitis externa in dogs. Otitis externa is an infection of the outer ear that is caused by fungi and/or bacteria. Otomax Suspension is also effective for treating inflammation that is caused by the infection and helps relieve symptoms including itching, discomfort, redness and swelling. How does Otomax Suspension work? Otomax Suspension contains three medications for topical treatment of ear infection and inflammation in dogs. Gentamicin sulphate in Otomax Suspension is an aminoglycoside antibiotic and is effective against a wide range of susceptible bacteria that can cause ear infection in dogs. It works by inhibiting bacterial protein synthesis, which prevents the bacteria from producing important proteins needed to grow and kills the bacteria. Betamethasone in Otomax Suspension is a synthetic corticosteroid that works as an effective anti-inflammatory by blocking the production of inflammatory chemicals like prostaglandins and leukotrienes; also cyclooxygenase (COX 1 and COX 2), the enzymes specifically involved in prostaglandin production. Clotrimazole in Otomax Suspension is a broad spectrum antifungal used to treat fungal infections of the skin. It is effective against the yeast Malassezia pachydermatis (formerly Pityrosporum canis) that causes ear infections in dogs. It works by inhibiting the synthesis of ergosterol, an important component of fungal cell membrane that is not found in animal cells. This weakens the fungal cell membrane causing the cell contents to leak out killing the fungus. The three components of Otomax Suspension work together to fight the infection that causes otitis; they also help relieve symptoms of inflammation caused by the infection. What does Otomax Suspension contain? Otomax Suspension contains the active ingredients Gentamicin sulfate equivalent to 3409iu gentamicin base, betamethasone valerate equivalent to 1.14mg betamethasone and clotrimazole 11.36mg per mL of Suspension. Otomax Suspension contains three active ingredients that work together to treat chronic and acute otitis externa in dogs, which infection and inflammation of the outer ear caused by a yeast fungal infection and/or a bacterial infection. Gentamicin in Otomax Suspension is an antibiotic and clotrimazole is a broad spectrum antifungal. These components of Otomax Suspension combat the infection that causes otitis. Betamethasone is a synthetic corticosteroid anti-inflammatory that inhibits the production of inflammatory chemicals and helps relieve symptoms of inflammation caused by the infection, including itching, discomfort, redness and swelling. What are the side effects of Otomax Suspension? The most commonly reported side effects when using Otomax Suspension include deafness or partial hearing loss and impaired balance in some sensitive dogs due to gentamicin; increased thirst and urinating due to betamethasone, which if used for prolonged periods or ingested can cause vomiting and diarrhoea, also symptoms of long-term corticosteroid use like immunosuppression. Clotrimazole may cause some skin irritation. When should Otomax Suspension not be used? Is taking other medicines that can cause damage to the inner ear (ototoxicity) such as other similar antibiotics, some diuretics and some non-steroidal anti-inflammatories, when used in conjunction with gentamicin in Otomax Suspension. How should Otomax Suspension be used? You should clean and dry your dog’s ear before applying Otomax Suspension, remove any debris or crusting with a non-irritable solution and clip away any hair that would get in the way of treatment. Add the appropriate number of drops of Otomax Suspension into your dog’s ear, depending on their size and massage the ear to ensure it has penetrated into the ear and distributed evenly. Avoid contact with the eyes. You should apply the Otomax Suspension daily for 7 days but no longer as continued used could prevent wound healing. How much Otomax Suspension should be used? You should apply the following dose to your dog’s ear, depending on weight. How long should you apply Otomax Suspension? You should apply the Otomax Suspension daily for 7 days but no longer as continued used could prevent wound healing. If you miss a dose of Otomax Suspension apply it as soon as you remember, unless it is time to give the next dose, then skip the missed dose. Do not apply a double dose. How should Otomax Suspension be stored? You should store your Otomax Suspension below 25°C in a cool dry place.